Flamenco, tapas, sangria, golden sand beaches, old towns, ancient cathedrals, sprawling 13th-century cathedrals, and plenty of UNESCO sites. These are just a few of the attractions a well-planned Spain itinerary can offer you. You can explore the ruggedly scenic Basque Country, learn about Spain's history in Granada and Toledo, and eat and drink 'til you drop in Barcelona. 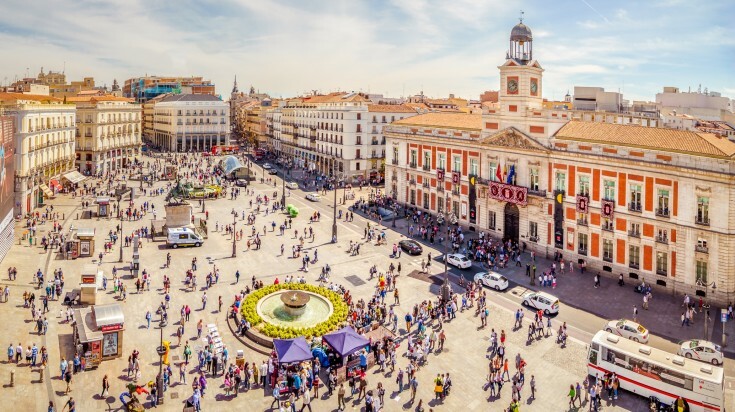 Great for those on a tight schedule, this four-day Spain itinerary starts and ends in Madrid and offers a heavy dose of culture and history in a short period of time. Day 1: Spend your first day in Madrid exploring the famous public squares like Puerta del Sol and Plaza Mayor. Also indulge in shopping and eating in Mercado San Miguel. Day 2: Wake early and set off into the scenic countryside outside Madrid and make your way to Cordoba. This city is known for its impressive medieval architecture and its exotic mix of Jewish and Arabic cultures. Cordoba’s old quarter, ancient mosques and churches, and white-wash buildings are the highlights. Spend the night here. Day 3 & 4: Spend the morning finishing up the attractions in Cordoba before making the quick 145 km journey down to Seville. The Spanish city known for its nightlife and flamenco dancing also possesses a rich history and scenic location on the Guadalquivir River. Here you’ll find plenty to occupy your third and fourth days in Spain. The Cathedral of Saint Mary steals the show as the largest Gothic building in Europe. Next to the cathedral is La Giralda, the tallest landmark in Seville and the only remnant of the city's 12th century mosque. Pass the afternoon by strolling through Plaza de Espana and the Maria Louis Garden. Spend the evening on the riverside promenade in one of the city's lively bars or taking in a famous Flamenco show. Spend the night in Seville and the following morning before heading back to Madrid the next afternoon. This 6-day itinerary through Spain is a whirlwind but it hits all the high notes. 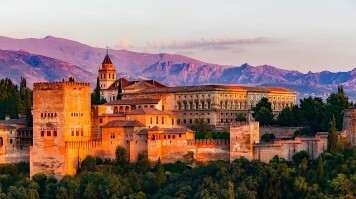 It includes the cities from the 4-day excursion with the addition of Granada. Note the starting and ending points are different which allows for more time in each destination. Day 1: Arrive in Madrid and get a sense for the city by strolling down Gran Via, Madrid’s entertainment, shopping and cultural hub. Immerse in the city's hustle-bustle. Wander around the city's most famous areas like Puerta del Sol and Plaza Mayor. Grab a bite in the Mercado San Miguel and visit some of the city’s famous museums. Spend the night here. 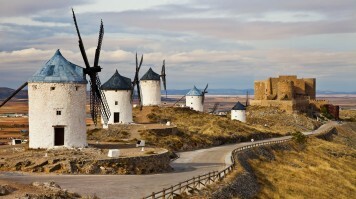 Day 2: Leave Madrid and wind your way through the land of Don Quixote on your way to Cordoba. Here you'll view the city's famous Great Mosque. Spend the night. Day 3: Discover more of Cordoba on today. Explore the historic town center and cross the Roman Bridge (especially beautiful in the evening when it’s lit up!) Check out the Alcazar de los Reyes Cristianos, Calahorra Tower, and Palacio de Viana. 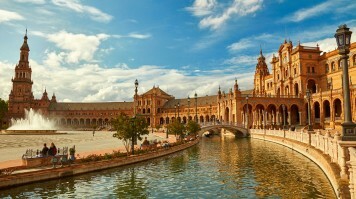 Day 4: Rise early and arrive in Seville (145 km away) with enough time left in the day to discover its many attractions. Visit the largest cathedral in the world, wander through the Santa Cruz quarter (old Jewish quarter) and check out the royal palace. Spend the night in Seville. Day 5 & 6: Arrive in Granada (250 km away) and dive straight into the main attractions — the Alhambra and Generalife Gardens. The evening is set aside for experiencing the nightlife in the old gypsy quarter in the Sacromonte district. On your final day in Spain, check out Granada’s other attractions like the Plaza de San Nicholas which promises stunning views over the city. 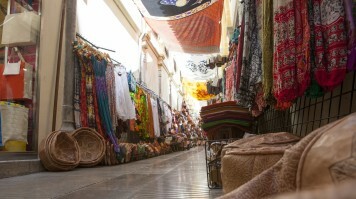 Finish up the day by shopping for authentic souvenirs in Alcaiceria Market. This Spain itinerary takes into account the traveler who wants to experience two different sides of the country. 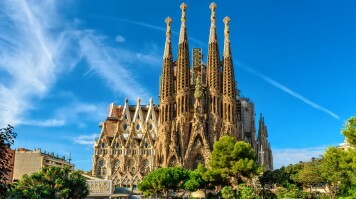 The 10-day tour includes Spain’s historical and cultural highlights in addition to the stunning Mediterranean coast. Note, this tour starts and ends at different points. Day 1: Arrive in Madrid early to enjoy your only day in the significant city, before setting off for southern Spain’s attractions. Take a sightseeing tour and view the sprawling plazas of Mayor and Cibeles and shop the well-known San Miguel and El Rastro markets. Or indulge your artistic side at the Prado Museum, the Thyssen-Bornemisza Museum, or the Queen Sofia Arts Center. Day 2 & 3: Most of day 2 will be spent in traveling to Seville. It’s a long 530 km from Madrid, but once there you’ll relax for two nights. Use this time to discover the world’s largest cathedral, the lush city parks, and a fun night out experiencing the local Flamenco flavor. Or take a Guadalquivir River tour to learn about its history and view more of Seville’s popular attractions from a different vantage point. Day 4: Rise early on day 4 to arrive in prehistoric town of Ronda before afternoon. 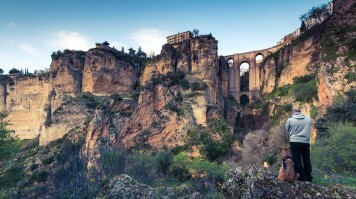 Ronda is situated in a mountainous area on the edge of a perilously high canyon created by the Guadalevin River. The most iconic sight is Puente Nuevo, the famous 18th-century bridge spanning the 120 m deep El Tajo canyon. Ronda is also known for its fine wines — save some time for touring the 20 or so wineries in the countryside. Spend the night here. Day 5 & 6: Carry on towards the coast until you hit the stunning Costa del Sol. 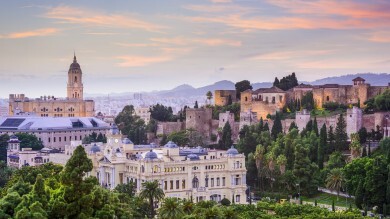 Slow down and unwind from the first leg of the trip with two nights on the Spanish Riviera. Lounge on El Bajondillo beach, hang out at the beach bars and have a leisurely meal at one of the beachfront restaurants. 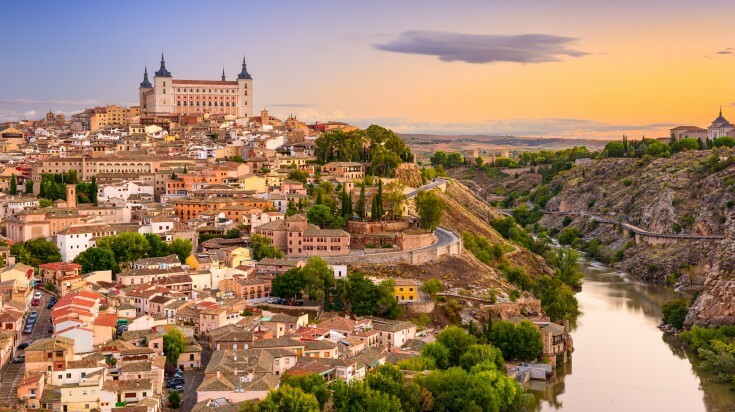 Day 9 & 10: Use the morning to reach your last stop, the Imperial City of Toledo. Occupied in the past by Jewish, Arabs, and Christians, examples of this cultural blend are noticeable in many of the city's most cherished landmarks and monuments. A walking tour is the best way to get acquainted with the town. Wander the city's cobblestone streets, see the famous Gothic cathedral, get a bird's eye view of the city from the Alcazar, and learn about the Arab architectural style at the San Juan de Los Reyes Monastery. Make sure to see damasquinado, an art form involving gold and silver made famous in Toledo. This 12-day itinerary differs from the others as it has you using Madrid and Barcelona as your home bases with much of the traveling done via day trips from these two hubs. This plan is ideal for those who want to see as much as possible without spending every night in a different city. Day 1: Start in Madrid and spend the first 5 nights of your trip to the capital city. In the first day, you can visit the Museo del Prado, Plaza de Santa Ana, Puerta del Sol (center of Madrid), and the Monasterio de las Descalzas Reales. Day 2: Spend another day in the city discovering modern Spanish masterpieces at Museo Nacional Centro de Arte Reina Sofia and Museo Thyssen-Bornemisza. Day 3: Head out of Madrid for your first day trip to Toledo. 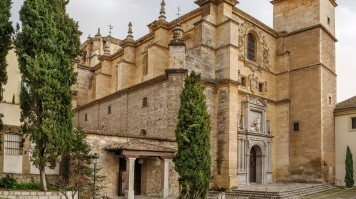 See the Alcazar, Cathedral de Toledo, and the Iglesia de Santo Tome. Return to Madrid. 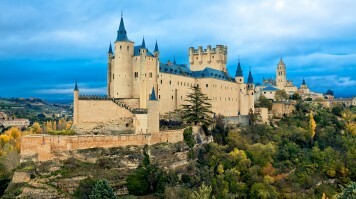 Day 4: Your second day trip is from Madrid to Segovia. Here you can enjoy a truly picturesque town with plenty of churches, monasteries, and — the town’s pride and joy — the ancient Roman aqueduct. You can also head 11 km southeast to see the summer palace of the Bourbon Kings, Palacio Real de La Granja. Day 5: Your final day trip from Madrid is to El Escorial, famed for its San Lorenzo monastery/mausoleum. From the royal palaces to the library, to the art galleries, this massive complex takes the whole day to explore. Head back to Madrid for your final night in the capital. Day 6 & 7: Leave Madrid and head south to Seville. Spend two nights here to relax from the long trip. Wander through the Barrio, check out the must-sees like the cathedral and La Giralda Tower. Art lovers can take a day to check out the Museo de Bellas Artes de Seville. Experiencing a Flamenco show in the evening is an absolute must! Day 8: Hop on a flight to Barcelona where you’ll spend the next 4 nights. Arrive and hit the ground running by exploring the Gothic Quarter and visiting the 13th century Barcelona Cathedral. Stroll Las Ramblas all the way down to the sea and carry on down the beach to feast on seafood at Barceloneta, the Old Fisherman’s Wharf. Cap the day by checking off La Sagrada Familia and taking in the breathtaking city view from the Montjuic Fountains. Spend the night in Barcelona. Day 9: Day 9 is all about appreciating Spain’s world-famous art culture. Visit the Picasso Museum, the Museu Nacional d’Arte de Catalonya, Fundacio Antoni Tapies, and the Fundacio Joan Miro. After today, you’ll have had your fill of paintings, sculptures, Romanesque and surrealist art. Spend another night in Barcelona. 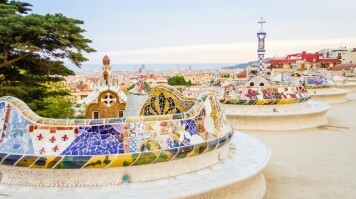 Day 10: Visit Gaudi’s quirky Parc Guell for multiple examples of his masterpieces within the park’s bounds. Head to Tibidabo Mountain for more stunning panoramic views of Barcelona then hit the shops at Passeig de Gracia. Day 11: Pull yourself away from Barcelona’s rapture and leave the city behind for your first day trip. Arrive in Montserrat to see the hilltop citadel via cable car. If you time your visit right (13:00 daily) you can listen to the oldest and most prestigious boys' choirs in Europe. Spend your final night in the city. Day 12: For your final day in Spain, head north from Barcelona to Girona and visit the number one attraction in all of Catalonia, the Dali Museum. If time is a luxury that you're lucky enough to have, this 15-day Spain itinerary is worth the extra travel. 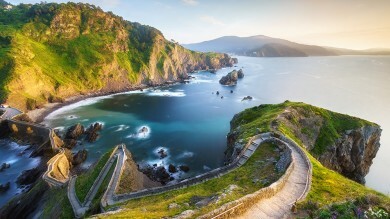 In addition to all the southern highlights, this tour also includes northern Spain and the Basque Country. The beginning of the tour starts out with more travel and then tapers toward the end, allowing you to relax and unwind before you head back home. Day 1 & 2: The tour starts in Barcelona. Take a full day for sightseeing the renowned Sagrada Familia, the Gothic Quarter, strolling Las Ramblas, and lounging on La Barceloneta beach. Spend two nights here. Day 3 & 4: From Barcelona, hop a flight to Madrid for market shopping and historic monument touring. Spend two nights here. Day 5 & 6: Make your way to Seville in the morning of your fifth day. This city is packed with attractions and two days is a fair amount of time to experience the cathedral, old Jewish quarter, a river cruise, and enjoy a late night in a Flamenco bar. Spend two nights here. Day 7 & 8: From Seville, cut across to the Mediterranean coastal town of Nerja for some chill time. Soak up the sun and the quaintness of the white-washed homes and narrow streets, seemingly unaltered by the modern world. Relax and recharge your batteries here for two nights. Day 8 & 9: In the morning of your eighth day, leisurely make your way to Granada. Make the rounds at the Alhambra and Generalife Gardens. Be sure to check out the Albaicin neighborhood and take in the vistas from Plaza de San Nicholas. Day 10, 11, & 12: Hop on a flight from Granada up north to start your Basque Country discovery. Fly into San Sebastian and make this city your home base for the remainder of the trip. Spend two days exploring Spain’s northern coast via San Sebastian. Hike the scenic hills, sprawl out on the sand, and discover the Old Town. Day 13 & 14: Take a quick trip to Bilbao for an overnight in another charming Basque Country town. Browse the Guggenheim Museum, whet your appetite at one of the many pintxos bars, and marvel the colorful architecture of the Old Town. Day 15: Head back to San Sebastian and catch your plane back home. Not every country can offer all that Spain possesses. With so many attractions, it could be easy to miss some of this country’s wonders. A properly planned Spain itinerary will ensure you see, do, and experience everything you hoped for. 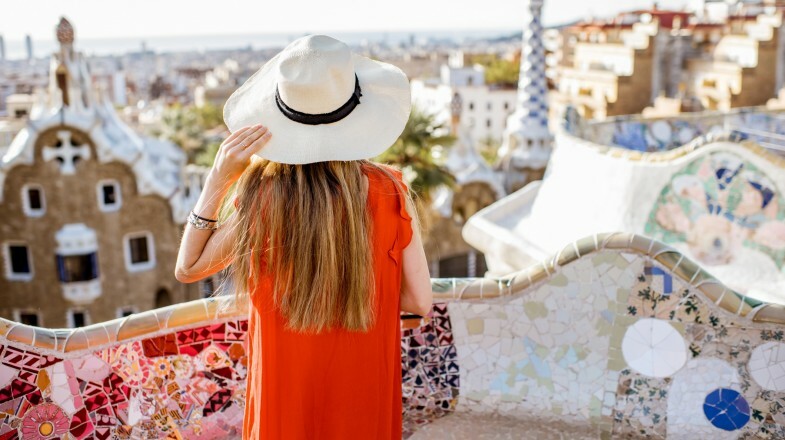 These whirlwind tours will have you talking about your trip to Spain for years to come — and probably leave you planning your return. May any of the itineraries interest you, connect with one of our Travel Experts in Spain to design and arrange the trip according to your needs.